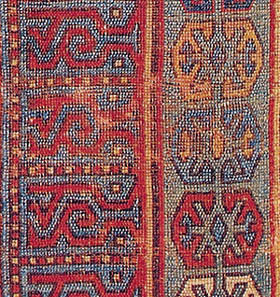 One of the earliest extant knotted-pile rugs in which offset knotting appears is the well-known "Faces" rug in the Kircheim collection. Both of its wide borders were executed completely with offset symmetrical knotting, although the entire field was done with normal, vertically-aligned knotting. 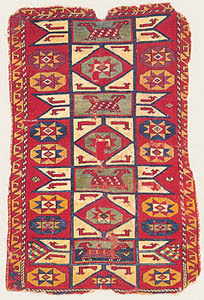 The outer red and blue border has flat, scrolling kilim-type forms, while the second border has multicolored hexagons enclosing kilim-derived motifs. Full view photos of this rug appear in Orient Stars, Plate 218, and Turkish Carpets from the 13th - 18th Century, Plate 14. The rug has been variously attributed to Anatolia and Azerbaijan, and is generally thought to date from the 13th or 14th century. 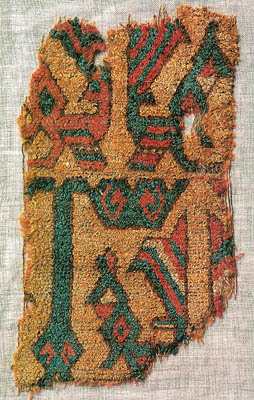 Among the carpet fragments found at Fostat in Old Cairo are examples with offset symmetrical knotting. Two that display this most clearly are shown below: Plates 15 and 16 from Carl Johan Lamm, Carpet Fragments, Uddevalla, Sweden, 1985. 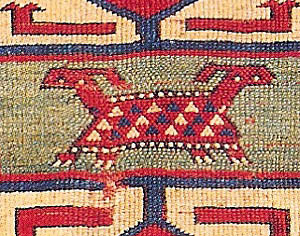 Again, it is when diagonal kilim motifs have been used that offset knotting appears. Lamm thought these two examples to be from the first half or middle part of the 15th century, and from eastern Anatolia or the southern Caucasus. He groups these pieces with the Marby rug on the basis of design details, palette, red outlines, etc., although that rug has no offset knotting. He does not mention this technical detail. A third Fostat example, Plate 14 in Lamm's book, appears below. Here kilim forms have been modified and combined with numerous vertical elements; the steep diagonals, however, have all been produced with offset knotting. Lamm also attributes this piece to eastern Anatolia or the southern Caucasus, and to the early 15th century. 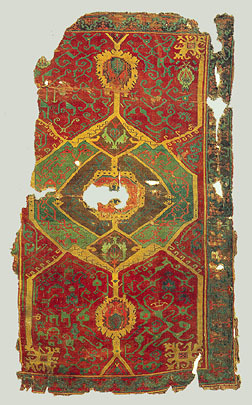 A famous early rug in the State Museums of Berlin - Museum of Islamic Arts (Inv. No. 88.12) has animal figures and kilim features in offset knotting that are related to the Fostat examples above, and also to the rug that follows. Friedrich Spuhler has speculated that this rug is from Central Anatolia, and from the 16th or 17th century. He suggests that it may have been part of a wider carpet containing more panels. Another famous early rug in Berlin - in the Museum of Islamic Arts (Inv. No. 85.984) also offers a surprise: The two-headed animals in the centers of the stars are articulated completely with offset knotting, including small triangles ornamenting the bodies. 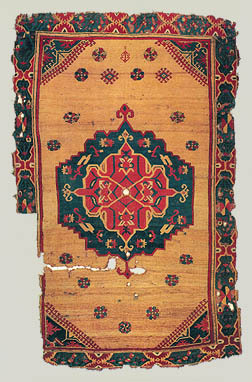 This rug is thought to be from western Anatolia, and perhaps the 16th century. All other parts of this rug are knotted in the normally aligned fashion. Another example of offset knotting used to articulate pure kilim forms appears in a rug fragment from the Christopher Alexander collection. It appears in A Forshadowing of 21st Century Art, New York, 1993, on page 237; a detail appears on page 7. Pairs of birds, composed solely of horizontals and diagonals and executed entirely in offset knots, make up the borders. 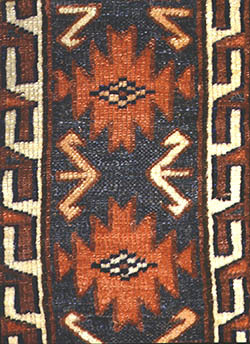 Half versions of the bird motif are stacked, kilim-style, rather than turned, in the side border. 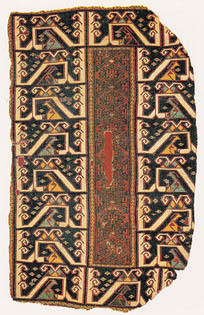 The field motifs in this rug are variations of common Holbein carpet derivatives, and all were produced with normal, vertically-aligned knotting. Although most such carpets are thought to have been made in western Anatolia, Alexander attributes this rug, which he identifies as "The Pregnant Bird Fragment," to Konya, and suggests that it was made in the 15th century. Although the border design is surely an early one, the degeneration of the central medallion and spandrel designs calls into question such early dating. 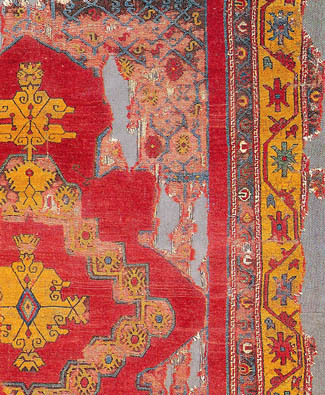 An important early Anatolian carpet in Alberto Levi's current on-line exhibition displays unexpected offset knotting. A large proportion of the design elements have been offset, along with large portions of the field. The carpet is a bridge of sorts between the elaborate city workshop rugs of Ushak in western Anatolia and much simplified examples from the Karapinar area of central Anatolia. 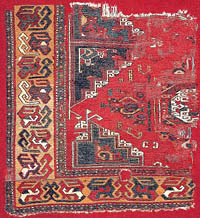 The piece also displays similarities to carpets from farther east in Anatolia. We can assume that because of an unbalanced and more coarse weave in this provincial piece, offset knotting was adopted to more closely replicate the design in the balanced weave of the fancy workshop pieces. Steep diagonals occur throughout the carpet -- in the center medallion, field, spandrels and border. Mr. Levi dates this carpet to the 16th century. 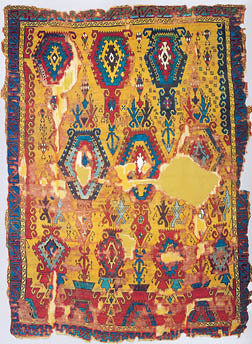 A related carpet from Istanbul's Vakiflar Museum, (No. 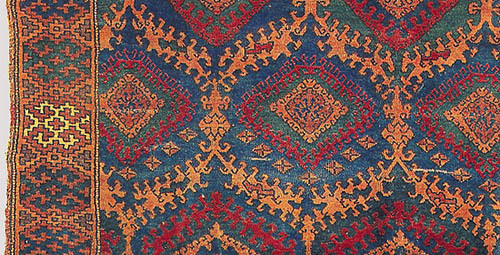 E-22), published as Plate 91 in Turkish Carpets from the 13th-18th Centuries, has offset knotting used more selectively in the design -- wherever steeply inclined diagonal design elements were needed. It has been attributed to central Anatolia and dated to the late 16th century by Nazan Olçer. Later rugs from the Karapinar area are the subject of a study by May Beattie in "Some Rugs of the Konya Region, Oriental Art, Vol. 323/1, pp. 60-75, 1976. This carpet, with its provincial version of a medallion and pendants, is one of a group from the Divrigi/Sivas area of eastern Anatolia. 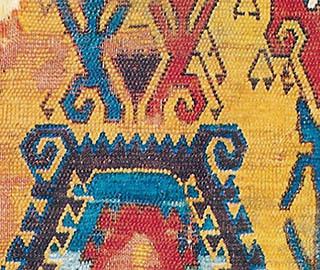 As in the carpet above, the weavers of this piece offset knots in selective areas to produce steeper diagonal elements; here, however, the knot count is more unbalanced. The carpet is from Istanbul's Vakiflar Museum (Inv. No. A-65), and illustrated in Balpinar and Hirsch, Carpets of the Vakiflar Museum Istanbul, Wesel, 1988, Plate 32. 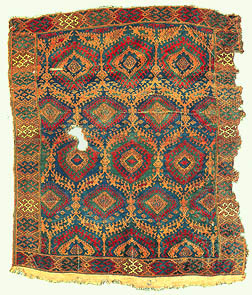 A rug in the Kircheim collection (Orient Stars, Plate 214) from the Sarkisla area southwest of Sivas in eastern Turkey has offset knotting throughout nearly the entire field. The borders were done with normal, vertically aligned knotting. 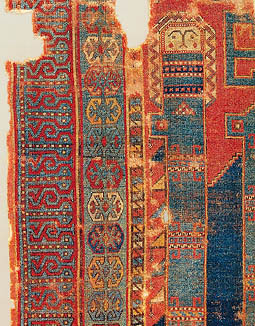 The steep, smooth diagonals and somewhat corrupted kilim patterning are typical of the rugs in this group -- most of which are thought to be from the 18th and 19th centuries. A piece with quite similar patterning appears in a HALI 117 advertisement of Milan dealer Moshe Tabibnia on p. 67, attributed to the 17th century. A more unusual Sarkisla rug, in fragmentary form, is illustrated in Christopher Alexander's Foreshadowing of 21st Century Art, pages 76 and 139. 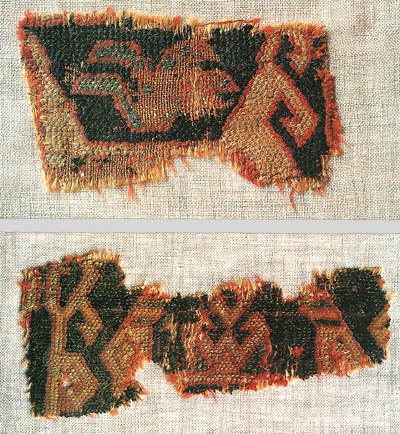 Like the example above, most of this carpet's field motifs were articulated with offset knotting. I am not aware of any flatweave predecessors of these forms, however; they seem to be freely drawn anthropomorphic and floral forms. 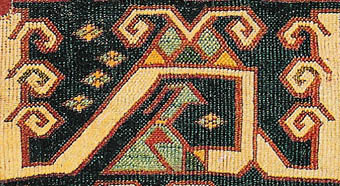 The angular, "cloud band" border was produced with normal vertically-aligned knotting. It is a geometric adaptation of a common workshop carpet border. 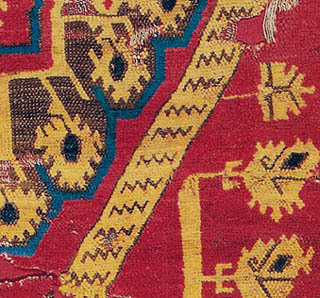 Still another Sarkisla rug with offset knotting in the Alexander collection appears on page 155. It has a severely simplified medallion, surrounded with a garland of small overlay-underlay brocade-derived motifs. Nearly all diagonals in the rug have been done with offsets: the medallion forms, the lattice-work ground, and the borders. 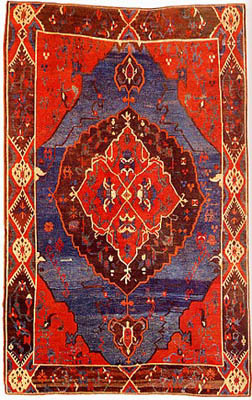 Alexander views this design as a precursor of the Ushak small medallion carpets, and thus from the 15th or 16th century. To me, the forms seem clearly to be derivative provincial adaptations or substitutions. Offset knotting was a significant part of the adaptation. This rug found in the Divrigi mosque in eastern Anatolia has been identified by Belkis Balpinar as Kurdish, from southeastern Anatolia. In the field, it has both kilim-type hooks and the angular diagonal hooks typical of overlay-underlay brocading. Both were articulated here with offset knotting. The border copies a standard Kurdish stepped motif with vertically aligned knots. Balpinar says this carpet is "impossible to date." Plate 68, Carpets of the Vakiflar Istanbul. Still another carpet from the Orient Stars collection with offset knotting is published as Plate 216 and shown in detail on page 24. This piece is an enigma. It has field patterning that surely developed from brocading, and a border with slit tapestry roots. All of the design elements, with the exception of the small stepped forms in the hexagon centers, were executed with offset knotting. The carpet is said to be from the 17th century, but I've heard no speculation as to its place of origin within Anatolia.